Due to the special property of the Pneumatic Floating Rubber Fenders, a low reaction force at low deflation, these type of fenders are extensively used offshore. Specially for Ship to Ship (STS) transfer of oil & gas or chemical related products, during off-shore constructions of platforms, wind turbines and others. Also in ports if sensitive products or equipments have to be passed from ship to pontoon/quay or v.v. - The diameters vary from 0.3 up to 0.6 meters. - The lengths vary from 4.5 up to 9.0 meters. 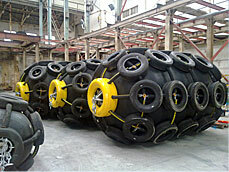 The production quality of the Pneumatic Fenders is controlled and certified normally in the production facilities. Mostly the Pneumatic Fender is protected by a �Netting�, existing of used car or plane tires bound together by chains or by �Ribs� (Rubber Rib Integrated) in the Pneumatic Fender. The Rib construction is lighter and less voluminous. 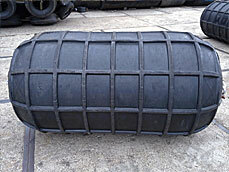 The standard color of the Pneumatic Rubber Fender is black. For war ships like frigates and submarines the fenders are colored in grey. 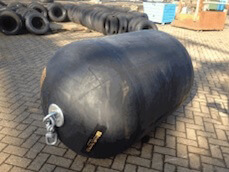 Normally a large stock of Pneumatic Fenders is available in The Netherlands. 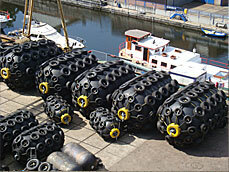 As a specialist in rubber technology we do inspections, refurbishment and repairs. Also we can re-net the Pneumatic Fender for an optimal protection. RIB fenders have wear-resistant rubber ribs vulcanized on the Fender body for extra protection in comparison to Body Only and Sling type fenders. 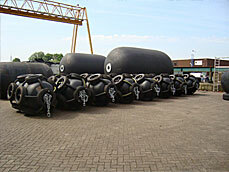 All fenders are supplied with SGS or ABS certificate proving the fenders are manufactured according to ISO 17357. All safety valves (if applicable) are certified. All components are certified and/or tested on break load. All fenders are standard equipped with airplane tires. They are very rigid and contain no steel, so they will not rust in (sea-)water. Heavy duty protection netting with standard use of airplane tires. Airplane tires are more rigid and have no steel inside. This will have a positive effect on the lifespan of both netting and Fender (proven in practice). Use of head tires to protect the Fender against damages by the towing rings. Towing rings, chain, shackles and swivels are certificed and/or random tested on break load. Rubber sleeves around the chain are going into the tires to prevent the chain cutting the tires. All chains are connected with certified connecting links and/or shackles. Towing rings, shackles and swivels (mounted on both sides) are designed and fully certified to the required MBL. Standard we use Cone type towing rings. Heavy duty protection netting is approved by all major STS companies. Re-certify all brands fenders safety valves; it is advisable to re-certify safety valves every 2 years. We have our own laboratory with all necessary facilities to overhaul and certify safety valves. For other dimensions please consult Denialink.